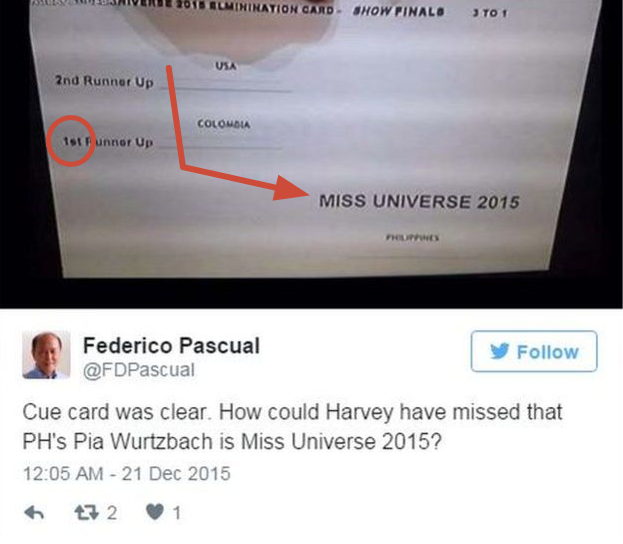 How would you have avoided the Miss Universe 2015 mistake? In case you missed it, over a week ago Steve Harvey incorrectly announced Miss Colombia as winner of the Miss Universe 2015 pageant. He later apologized and corrected himself; Miss Philippines won. If you're a program director of the pageant, how would you prevent this mistake? 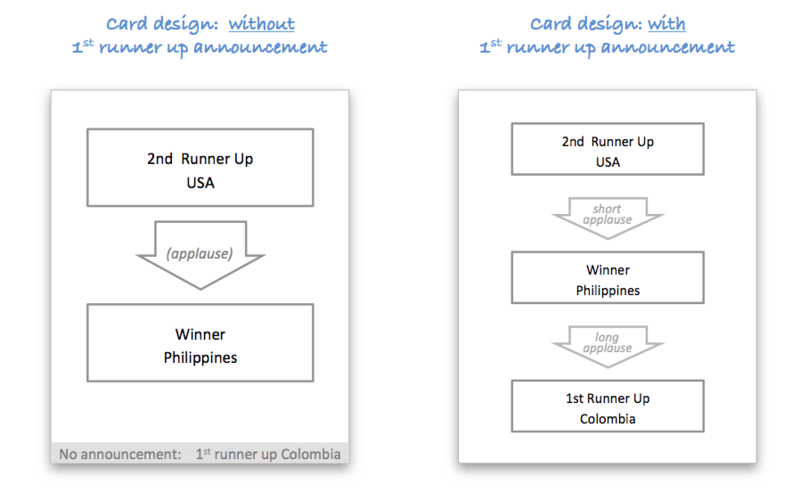 [Added Jan 1] In other words, how do you ensure the announces the correct winner and then immediately announces the first runner-up? I'm assuming most would re-design the cue card (I would), but that doesn't have to be the solution. The host may not have a teleprompter or large cue cards held by a stage hand (because the finalists are onstage with the host). The host must refer to the third-place contestant as "Second Runner-Up" and the second-place contestant as "First Runner-Up" (though they don't necessarily need to be referred to as such on paper). Any printed information that's seen by the host will only be seen by the host until The End of Time. [Edit again] Over the previous three pageants (2012-2014), there has been no commercial break between the announcement of the Second Runner-Up and the winner. In other words, there's usually not sufficient time to hand a separate cue card to host when only two contestants remain. I have my solution (I'll post it) but I'm curious to see what others plan. The design should be as simple as possible so that the host doesn’t waste any cognitive load in figuring out who each winner is. If there is any visual element that is not helping convey who those two winners are, then it becomes a distraction that will increase the room for error. Minor distractions, but when not done correctly all the little things like font size and spacing and alignment add up. As an idea, instead of vertical lists we can separate the winners out side by side, aligning it with the hosts natural reading direction (while this is in English), and giving the text as much space as possible so it becomes impossible to conflate the two categories nor countries. 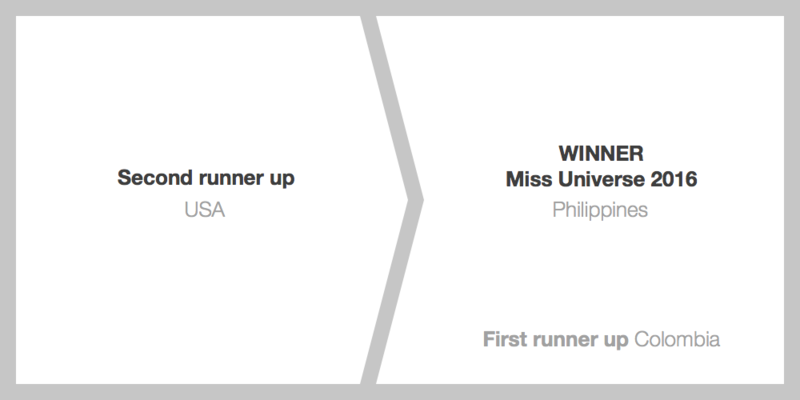 In the context of this announcement, the first runner up becomes the least important title among the winners, announced after the Miss Universe winner, and is given smaller prominence to reflect that. Some people have mentioned or suggested that the order of the winners should be as they are (so 2nd runner up, then 1st, then the winner) but remember that this card is not supposed to be a representation of the pageant winners, merely a tool for the host to do their job. Training for events like this is obviously important as plainclothes and others mentioned, but there should also be nothing wrong with coming up with a design so clear that anyone could see it for the first time and not have to think twice. Edit: I gave the first runner up more prominence as I learned the host does indeed announce that title after the winner, and spelled out the ordinal numbers as Basil suggested to allow for more natural reading for the host. One clear problem in this case: No thought was given to the function of layout and typography. In the chaos and excitement of a big event, with all eyes on the host and a few dozen million people watching at home, it's easy to get flustered and read without thinking. Hence the running joke about news casters reading whatever comes up on the prompt. It's critical to design the information for absolute clarity. The results are listed in the order they should be announced, in the words to be used, with adequate separation from one another, and the secret values are rendered in such a way that they are difficult to "spy". It goes without saying that such a large event comes with a lot of things to prepare for. The climax of the whole thing is announcing the results. Whatever the design is, you need to make sure that anyone involved in that moment can do their task without thinking. Design can make the task more learnable, but you still have to rehearse with a mock-up. I honestly cannot recall any example that can be used to demonstrate as many cognitive principles. The activation of specific concepts in memory for the purposes of influencing subsequent behaviours. 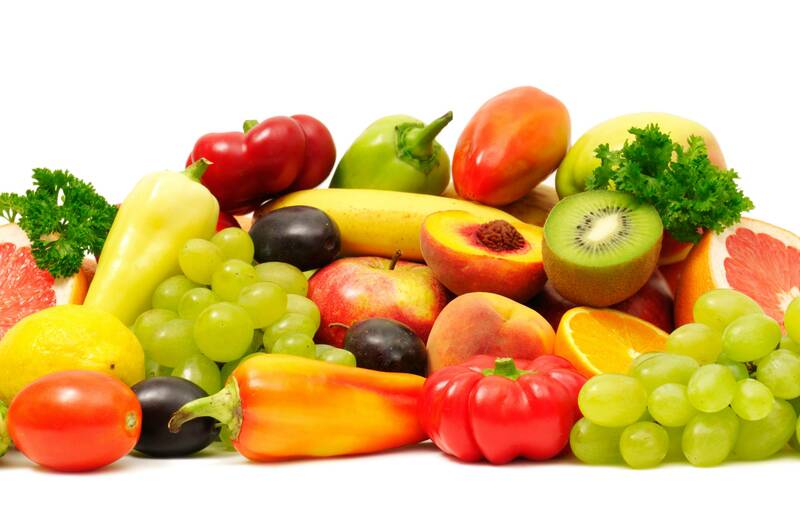 Although he speaks of purpose, spreading activation has it that the term is also used with relation to completely internal processes - like when in search for a tomato other red fruits stand out. Someone who's about to announce a winner will be primed for something like '1st' or 'first'. So no wonder the 1st runner up was picked by the announcer. When presented with words, our brain converts them from low to high level models. The visual features (lines, low level) and words (medium level model) matter not - it is their eventual semantic (high level) that is important. The brain, as it does, takes every shortcut possible for the sake of cognitive economy. Integration with existing knowledge happens when the stimuli models 'agree' with existing knowledge. So we don't really read everything, we stop once the stimuli model makes enough sense to be integrated with existing knowledge. You know what's coming next, don't you? Had it been the full sentence, in an appropriate context, your brain might have hardly surveyed the rest of the sentence. This is why proofreading your own text is challenging - you already know the meaning of it all, so existing knowledge makes the text more integrable and you miss obvious mistakes; unlike a fresh-reader who really needs to make sense of things. So for someone primed for '1st', the '1st' alone is enough to satisfy the integration requirement. One way to solve this is by not front-loading the line with '1st'. Inattentional blindness (see this famous demonstration), asserts that when people are focused on a specific task they could become cognitively blind to what would otherwise be an obvious stimuli. So once the '1st' was picked, Inattentional blindness may have well kicked in. 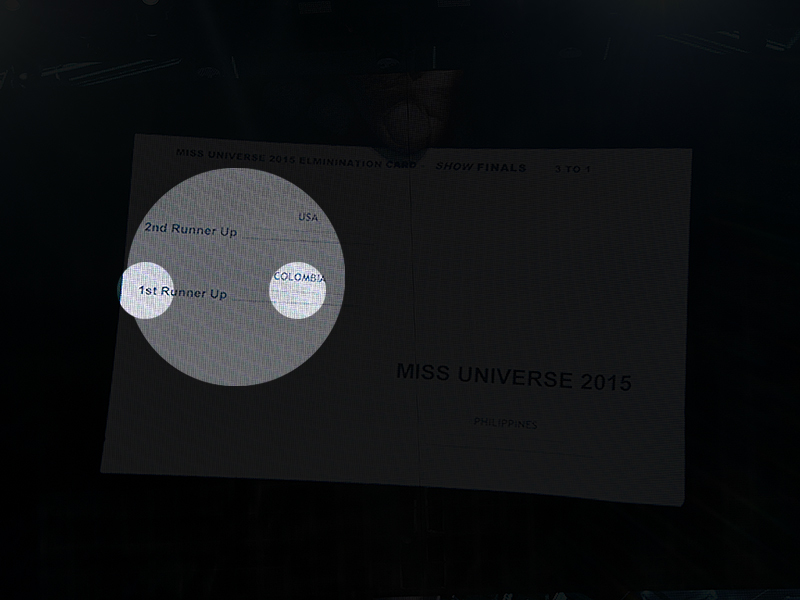 Note that 'MISS UNIVERSE 2015' can be simply seen as branding. The actual winner is in really small text. 1 Lidwell, W., 2010. Universal Principles of Design, Second Edition, Revised and Updated edition. ed. Rockport Publishers. The first problem I see is the 1st Runner up versus just '2nd'. So I also refer to their placing in the title to make it a bit clearer. How about drawing them on a podium. What caused the issue.. the concept or language usage of "Runner up" .. It was less of an information design issue, and more of a Language/ Verbiage issue. He saw "1st" and the number 1 - First went into his head either he did not know the significance of "Runner Up" or it did not factor in given that he was reading the numeric: 1. If someone does not know what "Runner Up" means, then they'd confuse that with First place. I've seen it used more in Brit English than US. Even if they did hear/ know about "Runner Up", in popular usage, language & cultures the numeric 1, habitually points towards Winner; thereby the inherent mental conflict while on stage. Maybe thats why Harvey's American lingo confused 1st runner up with 1st place. To prevent future issues and not knowing who might be reading it out, lets assume that the person may not understand language use of "Runner Up". The "Runner Up" word may not be understood as a "modifier word" by everyone and people may end up seeing the numbers "1st" & "2nd" for what they are. PS: I'd eliminate the Runner up thing, but if they really want to have those words be SPOKEN in speech, i'd DECOUPLE it from the Index/ Rank numbers. Here's an updated answer with the optional "Italics" runner up section. Additional: It may be possible to change the order of 2nd and 1st/ winner if the organizers want the 1st place/ winner announced before the 2nd place, if thats what is needed for the Reader/ Host. But, a little bit of demarcation from 2nd & 3rd place holders by SPACE & SIZE will also help. I think on top of some of the good points already mentioned above such as layout & typography, minimizing the information would play a critical role. Even with the cue card that Steve Harvey was holding, just swapping the place of 1st runner up & Miss Universe would have solved the problem, as the trend is always to announce the 2nd runner up, and then the winner (Miss Universe in this case). Reducing the information load by showing only the information that is needed in the moment helps in minimizing the chances of error. Of course, the name of the 1st runner up should be mentioned in the cue card but not in the prime spot, as this is just to reconfirm who the winner is for the host (if needed), but he/she doesn't actively need the information. I would give preference to organizing the information in the order it needs to be retrieved over the conventional hierarchy. Put the runners up on a cue card, with a mad-libs-style script to be read, the names of the contestants filled in at the last minute. The script concludes with "and the winner is...". At this point the host produces a gold envelope, marked with a little embossed crown. He opens the envelope, and reads out the name inside. Basically, you make your crutches part of the ceremony, and you highlight that even the host doesn't know until the envelope is opened. This highlights the drama, and makes it impossible to mistake a runner up for the winner. edit: I guess the actual ceremony is the other way around, but you could open the envelope first, and then read the cue card. 1st Position - the winning Country. 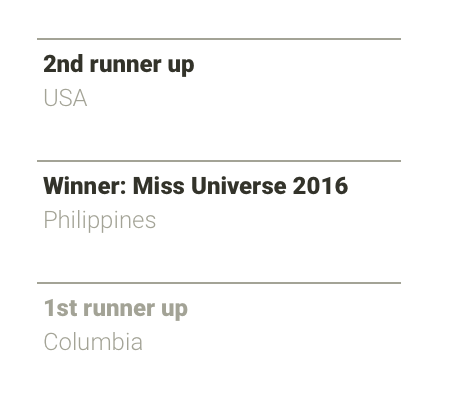 1st Runner Up is a confusing concept. You cannot have good UX with bad mental models. ...because the information to be presented is short, simple, and hierarchical. Clear, unambiguous communication - The reader is likely to be under high stress and the cost of error is large. Fortunately, the information is simple and the reader is speaking the results in a specific order, so layout is quite simple. Communicate narrative sequence clearly - Information should be presented exactly in the linear, narrative order. Minimize distraction - The use of different font sizes or weights distracts the reader. The title is as important as the country, so render them with equal size and weight. Use a clear, linear, natural reading layout - The announcement is made in English, so the most natural narrative layout is top-to-bottom. Asking the reader to process information left-to-right or, worse, in a non-linear fashion (as in the original cue card) is totally unnecessary congnitive load for such a simple information payload. The designs use simple UX principles: island grouping to organize and visually relate the chunks, top entry point with natural, top-to-bottom information flow, arrows to aid flow orientation and transitions, clear step-by-step / flowchart-style instructions in case presenter gets stage fright, and consistent presentation of hierarchical chunked information (same font, same alignment, line breaks between related information). The first design includes a subtle but visually separated footnote for the implied 1st runner up position. Although that should be completely clear after the winner is announced, the presenter may be under considerable stress so it doesn't hurt to provide the information for her/his reference. There are much better designs for the card, some are mentioned in answers given already, but I believe the error would have been avoided if they simply used different labels. The label "1st Runner Up", can easily be confused as 1st, especially under circumstances of stress. If labels "3rd", "2nd" and "Winner" have been used the error would not occur. A description error or selection error is an error, or more specifically a human error, that occurs when a person performs the correct action on the wrong object due to insufficient specification of an action which would have led to a desired result. I've watched miss Universe a few times across the years and previously noticed the MC used to hold 2-3 separate envelops with each contestants name inside and the place (1st runner up, 2nd runner up) written on the cover of the envelope. This is really a better way that guarantees no mix up like this. Not sure why they ditched this practice they had been doing for a long time and it worked well every time. My guess is, it was the budget!! why? because this is a more behind the scenes aspect and would have been neglected, and the organizers may have been trying to cut corners on thing they perceived as not major. All answers that show or describe better layouts for the card, treat it as a single two-dimensional surface. It doesn’t have to be. You can fold the sheet of paper like a brochure. I would suggest a C-fold (1), but a Z-fold (4) might also work, even a simple bi-fold (not pictured) would be better than none. The C-fold is the only one that is intuitively opened always the same way, so no turning of upside-down or backside-up text. The obvious trick is to make only the second runner-up visible in folded state or first opening step, and reveal the title-bearer on the next step. The first runner-up would be displayed less prominently way below the winner. There have been enough suggestion how exactly to do that typographically. No need to make any connections, use different font or the like, just read the sentences. Looking at Smitri's and plainclothes's answers, this appears to be (at least somewhat) a matter of personal preference. Some people would rather they were listed in order of placing (e.g. 2nd runner-up, 1st runner-up, winner) and then be expected to call them out in the correct order. Yet other people would like them to be listed in the order they need to be called out. However, As plainclothes has already stated, the importance here is on training. The announcer should've familiarised himself with the card (or had the opportunity) before the announcing. From a UX perspective, I would suggest a reasonable solution here would be to provide multiple cards in envelopes. One the front of each envelope would be only the placing of the name held within. In doing this, the announcer only needs to know the order in which to open the envelopes (not an unreasonable requirement). I see three major issues in the described situation; two are related to the card as shown, and one is inherent to the situation. The first issue related to the card as shown is that the information being presented is a list of three items, but the card makes it look more like a list of two items plus some unrelated, extra information. To treat this issue, the items should be formatted in a comparable way. That does not mean the same way; the items can use different font sizes, for instance, to highlight the winner. The important part is that the items have something in common - the same kind of bullet point, the same kind of frame, the same kind of layout ... none of this is the case in the card as shown, which is why the first two items on the card seem to form a pattern there, and the third item completely breaks out of this pattern. As this is contrary to expectations of the reader, it can easily lead to mistakes. 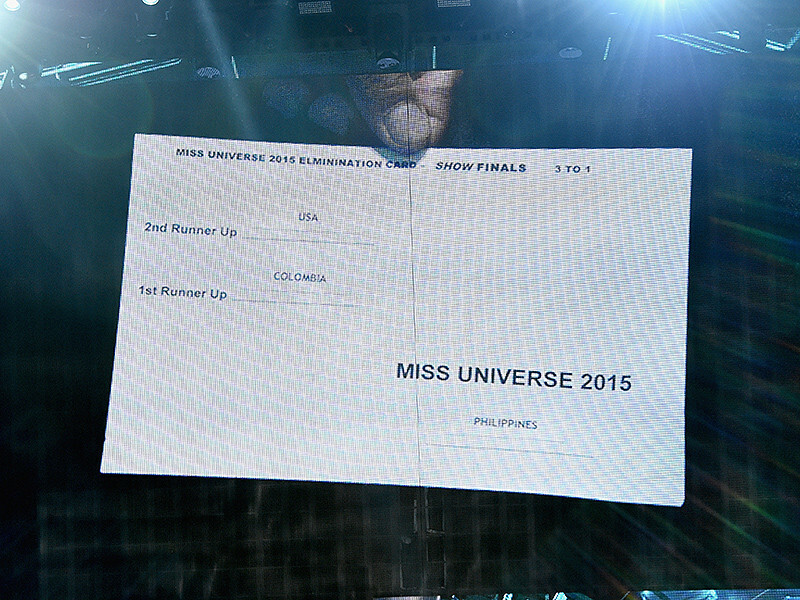 The second issue is that each of the items in the list has a specific meaning (1st, 2nd and 3rd winner), but while technically, all labels are provided, they are ambiguous (MISS UNIVERSE 2015 is indeed the label for the bottommost item, but could just as well be the title of the whole card - and the formatting and positioning do not help). This could be fixed by making each label clearly indicate that it is indeed a label - e.g. by something simple as putting a colon behind it, and possibly always placing it left of the value it denotes. On top of that, choosing less ambiguous texts (e.g. winner instead of Miss Universe 2015) is adviseable. The reading order cannot be dropped. If one leaves that bit of information away, the host is essentially invited to mix things up compared to the original plan in the heat of the moment. The ranking of the winners cannot really be dropped, either. Unless the host is just reciting a pre-fabricated text (which is somewhat unlikely, given that the cue card only contains some keywords rather than complete text), they probably choose their concrete words as they go. For that to work, it seems important that the host have a mental model of what they are talking about, i.e. the ranking of the chosen winners. Hence, both orders have to be incorporated into the card. It can be achieved by using positions for one of the aspects, and arrows for the other one. As a result, I would choose to indicate the ranking by means of the position. This seems more logical to me as readers see at one glance which one of the three items they are reading. Assigning different positions than the numbers 1st, 2nd, and 3rd winner, or top, middle, and bottom winner, or whatever terms the host might be thinking of, is confusing, comparably to the well-known read out colour names coloured differently than what they say pictures. Conversely, for the reading order, the host just has to know where they are and what is next. There does not need to be a clear sense of a numerical position in the list, while the sequence aspect, transitioning from one item to the next, is much more prevalent. Therefore, this aspect lends itself to being expressed with arrows. This card indicates the reading order with arrows that the host can easily follow, while at the same time, the mental model of the subject matter at hand, the ranking of the contestants, is represented by the positions of the list items (and further supported by font sizes). The initial arrow is the only one that starts out of nowhere, the others are directly connected to the frames of preceding items for a clear visual contrast. Moreover, the initial arrow starts in the top left corner, the presumed start of the page in the reading direction of the host, so it is hard to miss that point of entrance1. The placement of the arrows alternates between left and right, so even if the host somehow loses track of which box they were at, they might still know on which side the next arrow was supposed to be (similar to when you are reading a book, and you don't remember the exact page you are on, but you are always somehow aware whether you're on a left or a right page). 1: Given that the original cue card contains only superficial information, I am assuming that there is some minimal briefing for the host. If the card is supposed to be entirely self-explaining, I would consider adding the text read along these arrows or something like that to the beginning of the initial arrow. 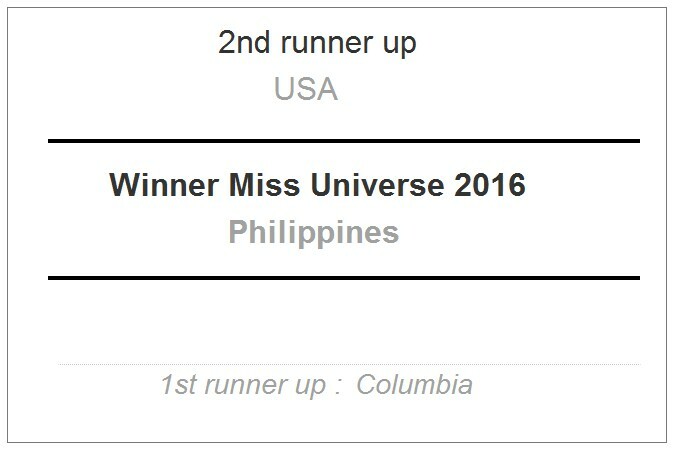 I would have put "PHILIPPINES" in caps and bold, in the same lettering as "MISS UNIVERSE," to establish a clear association between the two, and a clear "separation" from First Runner Up and Colombia. Here's my cue card. It's written in prose like an actual cue card and the three finalists are grouped into two statements. Whitespace all around the text prevents the card-holder from blocking the text with a thumb. One thing I've seen used in some events (and I recently haven't watched much TV, especially awards shows, which I can't stand) is to have three envelopes for all the finalists that place. The remaining finalists could be on a cue card which also indicates which envelope to open when given the rather unusual sequence discussed here. Inside the envlopes could be just the winners identity, but a cue card emphasising the identity would be better. They're clearly labelled on the outside (could even be gold/silver/bronze) and the names are inside. Rather than being sealed they should be easy to open. Opening the envelope is part of the show, so the extra UX step (for the host) isn't very relevant -- the extra viewer experience element could be regarded as a feature. In addition, an assistant (probably a co-host) can hand each envlope to the host in turn, providing a double-check. That doesn't work for a single cue-card. I would like to direct fellow designers to look at the Information flow. I am afraid a card design will suffice. It starts off with Identifying the winners and ends with Announcing winners. There are high chances of information breaking up in this chain. Yes, the card is badly designed. Information Hierarchy has taken a hit. The card is pre-printed with the winners typed and printed later. i.e The Card template is designed by someone else. While the content is filled in by someone else. Human nature to glance through information in a heated situation. This is a beautiful design process lesson learnt! Thanks to everyone for pitching in and thanks to Tim for posting. Based on the ideas I am about to present, here is my clear answer about what I would have done to make the cue card look different: nothing. (That is why I'm showing the identical image.) I will now state my strategy very clearly: The cue card is not how I would have achieved different results. After using that cue card, I could then make sure there are rehearsals. Rather than plucking off some Joe Schmo off the street, I may pick a relatively well-known celebrity which has a track record of providing some quality content. In the end, I conclude that I may be burned, no matter what I try to do (especially with the "cue card"). I suppose I could do some other things, like specifying in the contract that the announcer is required to read things word-for-word, and providing this person with a detailed script that contains paragraphs of prepared sentences, so that the announcer has far less words to need to make up on the fly. However, in the end, I am putting my trust in another person, who could betray that trust (through incompetence, or perhaps maliciousness). No matter what controls I place, in the end, some of this is really out of my hands. So, even if I apply some of the techniques provided by some of the other answers, I may still be burned. The one biggest thing I may be able to do, which really could help quite a bit, is to NOT broadcast live. Place in at least a half-hour delay, and if some catastrophe happens where a certain announcer proves to be unable to say the right words, then re-broadcast with a replacement announcer. 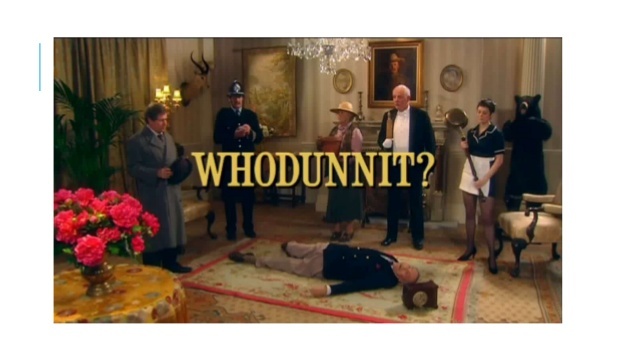 Unless there was a conspiracy between the performers on stage, along with the technicians who could lock me out of the broadcasting room, then a single person's error would likely only lead to a rather limited embarrassment, like "six thousand people crammed into a theater saw an embarrassing incident live, before a corrected run was performed and then broadcast". That would be way better than "millions of people saw this embarrassing incident, and it was broadcast so surely there are tons of widely available recordings of this embarrassing incident". if you're a program director of the pageant, how would you prevent this mistake? This doesn't completely prevent "this mistake" of the wrong name being announced. (As I said before, strategies can be done to reduce the likelihood of that problem, but not to negate the risk entirely.) However, if you define "this mistake" as also including some of the resulting negative consequences of the wrong name being mentioned, there are some things that could be done. Another thing I could do is to have the winner's name automatically show up, possibly on a large computer screen which automatically shows the name the moment a large amount of volume is given to the microphone (after the finale pause that comes after the announcer said "and the final winner is..."). That would have improved things by immediately showing a mismatch, even before the "winner" walked down and picked up a crown. The resulting confusion could have immediately led to more people wondering what was happening, possibly helping to prevent the initiation of ceremonies that temporarily decorated an incorrect winner. Not the answer you're looking for? Browse other questions tagged information-design document-design technical-writing or ask your own question. How to tell user if they are offline or online? How to change our design or content that users open our website when they see the content?